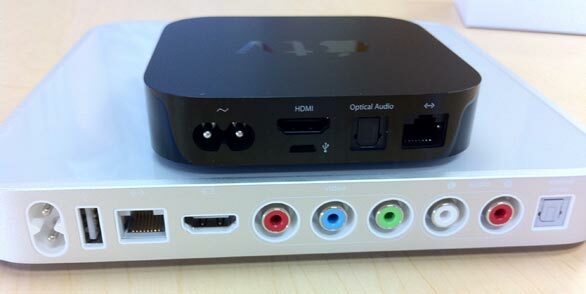 The original Apple TV, announced in 2006 and released in early 2007, was Apple’s first take on providing media streaming to the living room. Four years and three software updates later, the Apple TV remained just a “hobby,” to use the word repeatedly uttered by Apple executives to describe the product. With the release of the new second-generation Apple TV, Apple has dramatically changed the device’s technology while also redefining the product’s target audience. It’s an enormous change with a huge amount of upside, but until the device becomes more flexible it’s still a work in progress. Before digging into the details of what the Apple TV’s software does and doesn’t do, it’s worth reviewing the hardware itself. Almost the only thing the new Apple TV has in common with its predecessor is its name: The previous silver-and-white model was essentially a stripped down Mac powered by a single-core Intel processor and running a modified version of OS X 10.4. With its included hard drive, it had a bigger footprint than a Mac mini, consumed a lot of power, and threw off a whole lot of heat. Contrast that with this new black box, a quarter of the size of the original Apple TV, running a version of iOS just like the iPhone, iPad, and iPod touch, and powered by the same Apple A4 processor used in the iPad. The new Apple TV relies on solid-state storage (8GB worth, according to iFixIt) rather than a moving hard drive, sips power, and runs cool to the touch. To top it all off, the previous Apple TV cost $229; this new, vastly more advanced model will set you back $99. The Apple TV is 3.9 inches square, 0.9 inches high, and weighs 0.6 pounds—or, to put it another way, it’s really small. On the back you’ll find a plug for the included power cable, an HDMI port capable of carrying HD video and 5.1-channel digital audio to your TV, an optical digital audio port for connecting directly to a surround-sound audio system, a 10/100Base-T ethernet port (in case you prefer wired networking to the Apple TV’s built-in 802.11a/b/g/n Wi-Fi), and a micro-USB port that Apple says is reserved for service and support (at least until some industrious people came up with a way to use it for other purposes). You’ll need to supply your own HDMI cable for use with the Apple TV, because Apple doesn’t supply one. And if your HDTV only has support for component inputs, and not HDMI, you’re out of luck. Rear ports of the new Apple TV (top) versus the original. Along with the major hardware upgrade, this new Apple TV comes with a shift in Apple’s philosophy about what the Apple TV is for. If we had to sum up the original Apple TV philosophy, it would be that the device existed as a way to take the iTunes content you stored on your computer and play it back in your living room, and also facilitate the purchase and rental of additional items from the iTunes store. The new model, in contrast, won’t let you buy stuff at all. The only financial transactions that happen on the box itself are rentals—of movies and, for the first time, TV shows. Since buying stuff from iTunes requires you to download the file and store it somewhere, you’ve got to do that from a Mac or PC running iTunes. (The Apple TV will play those purchases back, of course, but you must make the purchase on your computer.) Without a hard drive, there’s no way to sync that content from your computer to the Apple TV, so playback requires a Mac or PC with iTunes 10.0.1 or later to be running to watch anything not coming from the Internet. This is a big change for older Apple TV owners, who may have dumped lots of content onto the Apple TV’s drive and preferred to shut down their computers before sitting on the couch for the evening’s entertainment. It also marks the first time that Apple has truly embraced using its own hardware to facilitate the playback of paid video content from a service other than Apple, because the new Apple TV offers full support for Netflix video streaming. By default, you control the Apple TV via the included infrared remote. It’s basically the same aluminum remote Apple sells for $19 for Macs, but with a tiny design variation: the ring of buttons is ever so slightly raised. If you prefer to stow your Apple TV somewhere out of your line of sight (or aren’t a fan of Apple’s remote) you’ll need to control it by other means. The good news is, version 2.0 of Apple’s Remote app for iOS released this week will work as a Wi-Fi-based remote—and it’s now a universal app for iPhone, iPod touch, and iPad. The Remote app functions more or less the same as the the hardware remote, with the main difference between that you swipe and tap in the app instead of clicking buttons on the remote. It still works well for scrolling around the Apple TV interface and selecting items, and the addition of iPad support for the app makes an even more expansive and functional interface. The contents of the Apple TV box. Apple seems to have gotten in a groove recently when it comes to packaging. The company has slimmed down and eliminated as much plastic and waste as possible, especially on Macs and iPhones. 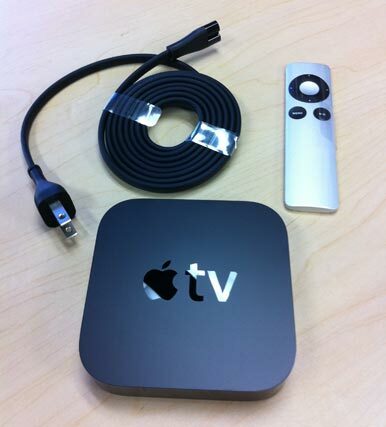 The Apple TV follows that trend, arriving in a tiny cardboard box. Inside there’s just the Apple TV, an elegantly wrapped power cable, the remote, and a small paper Getting Started guide. After attaching an HDMI cable and plugging the Apple TV in to our official Macworld flat-screen HDTV, we were up and running. The problem with a device like the Apple TV, though, is that to really get it working you need to enter in some data on a device that doesn’t come with a keyboard. Yes, the iOS Remote app will let you key in text—but only once it’s sharing the same network as the Apple TV! We had to enter in a Wi-Fi password and then an iTunes ID and password (in order to connect to iTunes and the Remote app via Home Sharing), all with the remote, before everything started working smoothly. It’s a pain, and there’s probably no alternative. At least it’s something you only have to do once. The first time we tried to rent a movie, we did run into a bit of security: the Apple TV prompted us for the security number on the back of the default credit card on the iTunes account we were using. Once we entered it, all future rentals happened with just a couple of clicks and no other identification was necessary. 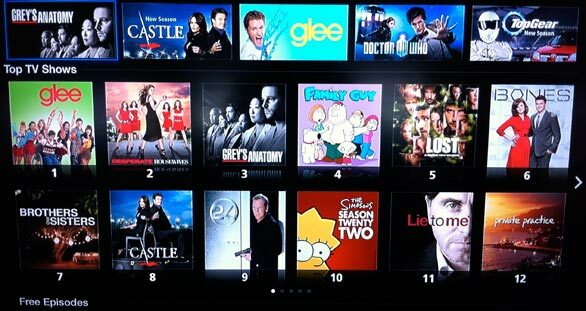 The current TV rentals on iTunes are a bit sparse. With the Apple TV limited to movie and TV show rentals, its view of the iTunes Store is now decidedly different: If something’s not for rent, it’s not there as far as the Apple TV is concerned. Although Apple counts 8000 movie rentals in the iTunes Store—about 3500 of which are in HD—the TV section is where the rental issue is especially apparent: there are some shows from Fox, ABC, and the BBC, but it’s not a huge selection and many popular shows from the regular iTunes list are conspicuously absent. Likewise, any movies available for purchase but not for rental are no-shows on the device. This is one of those cases where the deals Apple makes with content providers—and not the hardware or the software—have the biggest impact on the user experience of this product. If Apple fails to make rental deals with major networks (and statements from NBC and others indicate an uphill battle) or agrees to delay rentals of certain movies for 30 days after DVD release (for example, you can buy Iron Man 2 right now, but not rent it), that will make the Apple TV’s selection poorer. Although the Apple TV doesn’t have the storage to archive purchased content permanently, we have to wonder if there might not be some way to allow Apple TV users to buy videos that are available only for purchase and somehow queue up a download on a linked Mac or PC. It does seem a bit silly that you can rent a TV show for $1 but not buy one for $3. Instead, if you want to purchase content on iTunes, you need to do it from your Mac or PC. As before, you can still stream content stored in an iTunes library on your network to the Apple TV. The new model changes how the process works, however. In the past, you’d go to Settings -> Computers -> Add Shared iTunes Library and enter a 5-digit code in iTunes to link up your library and your Apple TV. Once you linked to an iTunes library, its contents would display in the My Movies, My TV Shows, and My Music sub-menus of the Movies, TV Shows, and Music menus. Now you accomplish the same thing using iTunes’ Home Sharing feature. In iTunes, select Advanced -> Turn On Home Sharing and you’re prompted to enter your iTunes Store ID and password. Once Home Sharing is turned on, you can select the contents of a synced computer’s iTunes library by choosing that computer by name from the Apple TV’s new Computers menu. In many ways, this setup process is easier than a code appearing on your TV and you having to go to the computer you want to link and enter the code. But in order to see each other, your Apple TV and any iTunes libraries with Home Sharing enabled must be using the same iTunes Store account. So if you have more than one account in your house, you won’t be able to stream all your content without some extra hassle. And how you stream is very important, because, as we’ve mentioned, there’s no longer any concept of syncing content to the Apple TV. With only a small amount of on-board storage—which is reserved mainly for buffering streaming content—the new Apple TV doesn’t let you transfer files to it from your iTunes library. Everything is either streaming over the Internet (from iTunes, Netflix, YouTube, Flickr, MobileMe, and the like) or from a Mac or PC. An informal survey of Macworld editors revealed that most of us gave up on syncing our Apple TVs with our iTunes libraries, due to the slowness of the syncing and the functionality of media streaming. But we admit, if you’re the kind of person who regularly filled the hard drive on the original Apple TV and wished that the drive was larger, you may be disappointed with the new Apple TV’s affinity for streaming and lack of storage. Just about every Blu-ray player, HDTV, and video-streaming device for sale today seems to include the ability to play streaming Netflix content. (Full credit to Netflix for making support for its service so pervasive.) The Apple TV, with its strong focus on Apple’s own iTunes Store, has never supported such a service in the past, but that’s all changed now. Netflix subscribers with streaming access (all plans $9 or higher offer unlimited streaming) can use the new Apple TV to watch the entire Netflix streaming video library. The Netflix interface the Apple TV uses doesn’t look like the ones found in most other devices that feature embedded Netflix support. Apple TV’s Netflix feature uses the same interface conventions as browsing through TV shows and movies on the iTunes Store. Apple says it wanted a consistent design with the rest of the Apple TV interface, and in that area the company succeeded. Poster thumbnails are laid out and look as they do when browsing Apple’s own iTunes Store catalog, and if you know how to use the Apple TV, you know how to use Netflix on the Apple TV. You can see what’s in your Instant queue; watch a queued item; search for new movies and TV shows by genre, new release, or name, and watch them or add them to your queue; remove items from your queue; and rate TV shows and movies. In our tests playing back both SD and HD streaming content from Netflix, the quality was generally as good as the source material, and on a par with the same content viewed streaming from Roku’s new XDS streaming video player. As with all the content we tried out, Wi-Fi and ethernet were equally acceptable options for streaming Netflix content. Anyone with the previous generation of Apple TV will tell you that its performance was severely lacking in many ways. It only could play 720p HD video files if they were 24 frames per second (and didn’t even manage that task particularly well in many cases). Pressing buttons on its remote was often an exercise in futility, as such actions would apparently go unheeded because of a complete lack of feedback from the UI—until they all triggered at once and you ended up playing and pausing a video half a dozen times, or clicked your way several menus past the command you were looking for. Those woes are a thing of the past. The new Apple TV plays 720p videos with ease. No stuttering, no frame drops. And the Apple TV’s interface is much more responsive to commands. We never felt frustrated when driving this Apple TV. The new Apple TV also runs much cooler than before, due mostly to the fact that it has no spinning hard drive to produce lots of heat. In fact, there are no moving parts—not even a fan. Apple says that in normal use, the Apple TV consumes a little more than two watts of power, and in Sleep mode (which is a true sleep, unlike the faux-sleep of the previous model) that number drops to less than one watt.